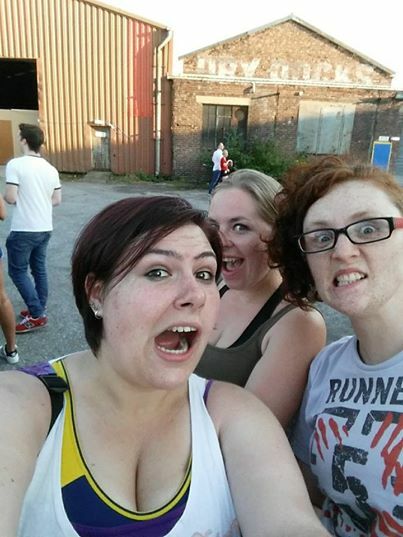 So it was AWESOME when I received some tickets to 2.8 Hours Later, in Manchester, as part of my leaving present from Lush Preston, this meant I could actually be Runner 5 and see if I could dodge & out run zombies for real! If you’ve never heard of 2.8 Hours Later, it’s an event put on by Sling Shot Effect, that are literally real world games. Basically, you’re off on a mission and a points you’re going to encounter Zombies & others who may help or hinder your mission, and scare the living daylights out of you. My present was tickets 2.8 Hours Later : Survival, the sequel to the 2013 game 2.8 Hours Later – Asylum. We arrived a little late for our 7:30pm start, it was a little hard for us to find the start location. We followed directions from Google Maps, and called the box office for some help, but couldn’t seem to locate it. We re traced our steps and when we reached our our starting point, we bumped into some others who were due to play, and we went the opposite direction to Google maps, and eventually found the start… and a giant queue. Leila, Tanya & me after seeing the A4 sheet with all the T&Cs! We were really worried about arriving late, but we didn’t need to, we had no problem joining the back of the queue and were handed a sheet explaining the event and some Terms & Conditions, given a brief explanation of what was on the paper and then asked to write our full name, and sign on the bottom. T&Cs were long, 2 sides, but after reading them all (we were in line for about 40 min) they were mostly what you’d expect. Including the brilliant reminder that even though we were about to play a game, physics still applies, and we should also look out for things like cars! We went in a team of 3, but when we reached the start of the line we were grouped up with two other teams of 2, as a super team of 7. I’d like to say I can remember everyone’s names, but I’m really rubbish at that kind of thing, and didn’t really take anything to write that kinda stuff down, sorry! Now, I don’t want to give the plot away, the game is running in other cities until the end of the year, and I’ve been told off by listeners at Preston FM for giving away spoilers for films & Game of Thrones, so I’m going to do my best to keep this spoiler free… but it was an awesome event & I might not be able to help it! We had been sent on a mission to collect some much needed supplies. We weren’t sure where they would be, but we were trained in how to hack into a computer system that would tell us where more supplies would be if that stash was empty. Once we had supplies, we needed to head to the rendezvous, and then we could head back to base. We had to ensure that the supplies (and the nominated team member carrying them) we completely uninfected. We set off, and our first encounter with the Zombies wasn’t too far away. It was both terrifying and hilarious! Hearing your mates scream like terrified horror film extras is something everyone should have the chance to discover! The Zombies were incredible, both creeping & quick, and incredibly great at making you forget that this was make believe! There were approximately 8 zombie events that happened across the 90 (ish) minute game, but it’s really hard to recount them all, as they were all part of the narrative. There were some great set pieces in locations, and the “random encounters” on the street between them were brilliant. It all rounds off into a “run the gauntlet” style encounter. We even had a few spectators, as some factory workers had obliviously heard the human (& Zombie ) screams and nipped out for some entertainment on a fag break! So did I survive the Zombie apocalypse? All that training Runner Five, didn’t do much good, did it? Imagine my surprise when I saw her in the Infected Zone with me! In the end there was 3 out of our team of 7 infected, we didn’t bring home any supplies for our base. We did have a great time, and I had a hell of a hunger when we got through to the after party! 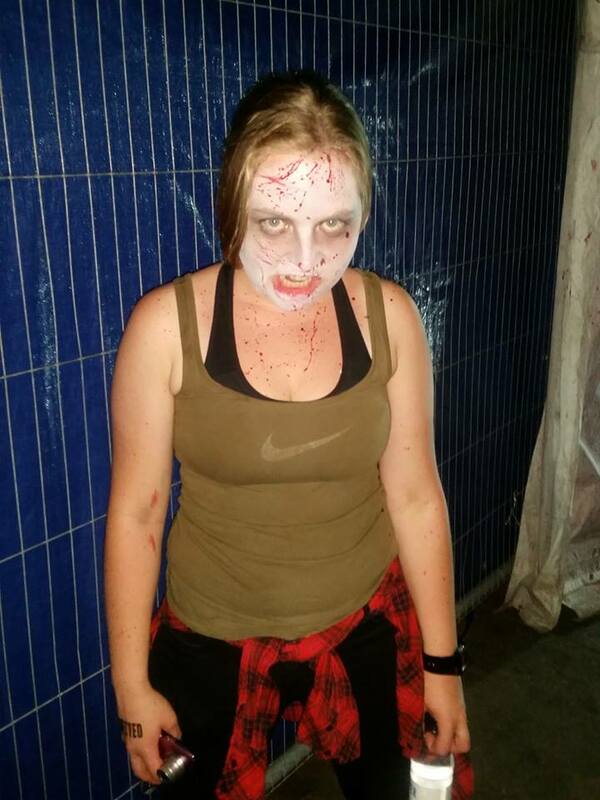 Leila survived… I think it was down to her amazing horror film scream at the first encounter! It was a brilliant event, and you really don’t need to be that fit to do it. We rocked up in running kit, but could have easily done it in a pair of jeans & some fashion trainers. There was even a team who did it dressed as a Start Trek away team, 2 guys in blue, one in gold and one “Redshirt” (yes, the Redshirt was the only infected on their team) those guys were dedicated to their memes and it made a great after party photo! There was an after party at the base, but we didn’t stick around, we had to head back to reality, it was Thursday night. 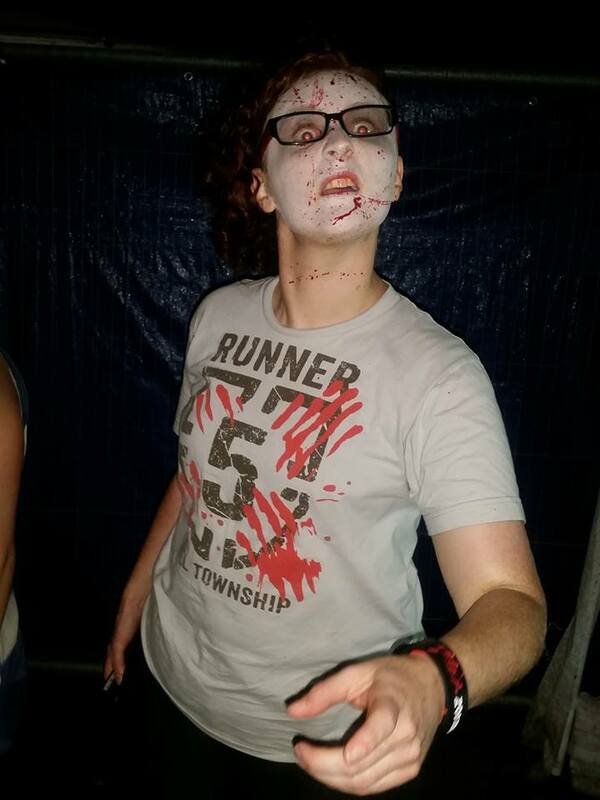 But we all agreed if we went on a Friday or Saturday event we’d be cracking out the moves to Thriller at the Zombie Disco! 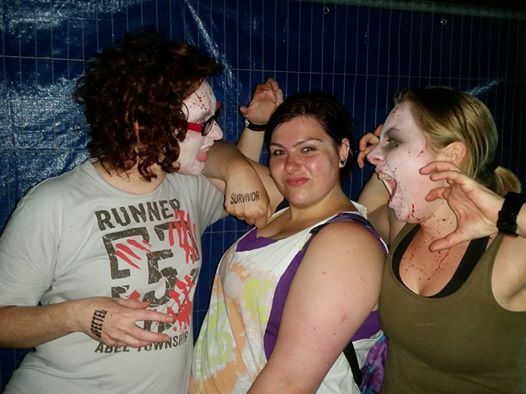 I’m 100% going to sign up for next years event, and possibly even consider volunteering to be a Zombie. Thanks very much to survivor Leila, who let me use her photos for this post, because I didn’t take many, I was having too much fun! Has anyone been to the event in other cities? I’d love to compare notes and see how / if the story changes?